HCM City (VNA) – The Ho Chi Minh City – Gyeongju World Cultural Festival 2017 will take place in HCM City from November 11 to December 3 with a series of cultural exchange activities between Vietnam and the Republic of Korea (RoK). The festival is part of activities to celebrate the 25th founding anniversary of the diplomatic relations between the two countries (December 22, 1992 - 2017). 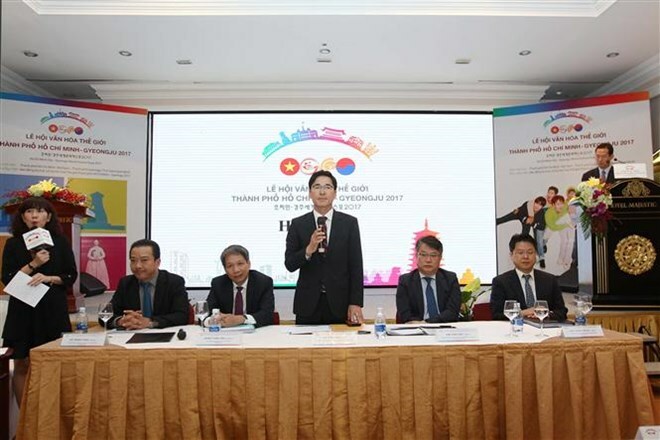 At a press conference on October 25, Doan Tuan Linh, Deputy Director of the HCM City Department of External Affairs said this is the first time HCM City has hosted the festival, which will be co-organised by the city and Gyeongsangbuk-do province of the RoK. He also voiced his hope that the event will bolster cultural exchanges between Vietnam and the RoK, thus strengthening the bilateral strategic cooperation and links between HCM City and Korean localities in particular. According to organisers, the festival will take place in many public sites of the city such as Nguyen Hue pedestrian street, 23/9 Park, and Ben Thanh theatre. The opening ceremony will be held on Nguyen Hue pedestrian street on November 11 with the participation of 1,200 guests from more than 15 countries worldwide, while the closing ceremony is scheduled for December 3 at the Hoa Binh Theatre. A number of cultural-art and events, activities introducing traditional products and tourist destinations of HCM City and Gyeongsangbuk-do as well as performances featuring Taekwondo and Vietnamese traditional martial arts will be held at the festival. It is expected to draw about 800,000 visitors, including local people, Koreans and other foreigners living in the city.